1 A None No Power Seat 1 A is a Premium seat with extra legroom, however the Exit door may be protruding into some of this space. The tray table is in the armrest, making the armrest immovable and slightly reducing seat width. There is no floor storage for this seat during take-off or landing. Seats in this row face the crew seats in front. 1 B None No Power Seat 1 B is an Premium seat with extra legroom. The tray table is in the armrest, making the armrest immovable and slightly reducing seat width. There is no floor storage for this seat during take-off or landing. Seats in this row face the crew seats in front. 1 C None No Power Seat 1 C is an Premium seat with extra legroom. The tray table is in the armrest, making the armrest immovable and slightly reducing seat width. There is no floor storage for this seat during take-off or landing. Seats in this row face the crew seats in front. 10 A None No Power Seat 10 A is a standard Economy Class seat. Note that none of the seats on this plane recline. 10 B None No Power Seat 10 B is a standard Economy Class seat. Note that none of the seats on this plane recline. 10 C None No Power Seat 10 C is a standard Economy Class seat. Note that none of the seats on this plane recline. 10 D None No Power Seat 10 D is a standard Economy Class seat. Note that none of the seats on this plane recline. 10 E None No Power Seat 10 E is a standard Economy Class seat. Note that none of the seats on this plane recline. 10 F None No Power Seat 10 F is a standard Economy Class seat. Note that none of the seats on this plane recline. 11 A None No Power Seat 11 A is a standard Economy Class seat that is missing a window. Note that none of the seats on this plane recline. 11 B None No Power Seat 11 B is a standard Economy Class seat. Note that none of the seats on this plane recline. 11 C None No Power Seat 11 C is a standard Economy Class seat. Note that none of the seats on this plane recline. 11 D None No Power Seat 11 D is a standard Economy Class seat. Note that none of the seats on this plane recline. 11 E None No Power Seat 11 E is a standard Economy Class seat. Note that none of the seats on this plane recline. 11 F None No Power Seat 11 F is a standard Economy Class seat. Note that none of the seats on this plane recline. 12 A None No Power Seat 12 A is a standard Economy Class seat. Note that none of the seats on this plane recline. 12 B None No Power Seat 12 B is a standard Economy Class seat. Note that none of the seats on this plane recline. 12 C None No Power Seat 12 C is a standard Economy Class seat. Note that none of the seats on this plane recline. 12 D None No Power Seat 12 D is a standard Economy Class seat. Note that none of the seats on this plane recline. 12 E None No Power Seat 12 E is a standard Economy Class seat. Note that none of the seats on this plane recline. 12 F None No Power Seat 12 F is a standard Economy Class seat that is missing a window. Note that none of the seats on this plane recline. 14 A None No Power Seat 14 A is a standard Economy Class seat. Note that none of the seats on this plane recline. 14 B None No Power Seat 14 B is a standard Economy Class seat. Note that none of the seats on this plane recline. 14 C None No Power Seat 14 C is a standard Economy Class seat. Note that none of the seats on this plane recline. 14 D None No Power Seat 14 D is a standard Economy Class seat. Note that none of the seats on this plane recline. 14 E None No Power Seat 14 E is a standard Economy Class seat. Note that none of the seats on this plane recline. 14 F None No Power Seat 14 F is a standard Economy Class seat. Note that none of the seats on this plane recline. 15 A None No Power Seat 15 A is a standard Economy Class seat. Note that none of the seats on this plane recline. 15 B None No Power Seat 15 B is a standard Economy Class seat. Note that none of the seats on this plane recline. 15 C None No Power Seat 15 C is a standard Economy Class seat. Note that none of the seats on this plane recline. 15 D None No Power Seat 15 D is a standard Economy Class seat. Note that none of the seats on this plane recline. 15 E None No Power Seat 15 E is a standard Economy Class seat. Note that none of the seats on this plane recline. 15 F None No Power Seat 15 F is a standard Economy Class seat. Note that none of the seats on this plane recline. 16 A None No Power Seat 16 A is a Premium seat with a missing window-side armrest but extra legroom. The tray table is in the armrest, making the armrest immovable and slightly reducing seat width. There is no floor storage for this seat during take-off or landing. 16 B None No Power Seat 16 B is a Premium seat with extra legroom. The tray table is in the armrest, making the armrest immovable and slightly reducing seat width. There is no floor storage for this seat during take-off or landing. 16 C None No Power Seat 16 C is a Premium seat with extra legroom. The tray table is in the armrest, making the armrest immovable and slightly reducing seat width. There is no floor storage for this seat during take-off or landing. 16 D None No Power Seat 16 D is a Premium seat with extra legroom. The tray table is in the armrest, making the armrest immovable and slightly reducing seat width. There is no floor storage for this seat during take-off or landing. 16 E None No Power Seat 16 E is a Premium seat with extra legroom. The tray table is in the armrest, making the armrest immovable and slightly reducing seat width. There is no floor storage for this seat during take-off or landing. 16 F None No Power Seat 16 F is a Premium seat with a missing window-side armrest but extra legroom. The tray table is in the armrest, making the armrest immovable and slightly reducing seat width. There is no floor storage for this seat during take-off or landing. 17 A None No Power Seat 17 A is a Premium seat with a missing window-side armrest but extra legroom. The tray table is in the armrest, making the armrest immovable and slightly reducing seat width. There is no floor storage for this seat during take-off or landing. 17 B None No Power Seat 17 B is a Premium seat with extra legroom. The tray table is in the armrest, making the armrest immovable and slightly reducing seat width. There is no floor storage for this seat during take-off or landing. 17 C None No Power Seat 17 C is a Premium seat with extra legroom. The tray table is in the armrest, making the armrest immovable and slightly reducing seat width. There is no floor storage for this seat during take-off or landing. 17 D None No Power Seat 17 D is a Premium seat with extra legroom. The tray table is in the armrest, making the armrest immovable and slightly reducing seat width. There is no floor storage for this seat during take-off or landing. 17 E None No Power Seat 17 E is a Premium seat with extra legroom. The tray table is in the armrest, making the armrest immovable and slightly reducing seat width. There is no floor storage for this seat during take-off or landing. 17 F None No Power Seat 17 F is a Premium seat with a missing window-side armrest but extra legroom. The tray table is in the armrest, making the armrest immovable and slightly reducing seat width. There is no floor storage for this seat during take-off or landing. 18 A None No Power Seat 18 A is a standard Economy Class seat. Note that none of the seats on this plane recline. 18 B None No Power Seat 18 B is a standard Economy Class seat. Note that none of the seats on this plane recline. 18 C None No Power Seat 18 C is a standard Economy Class seat. Note that none of the seats on this plane recline. 18 D None No Power Seat 18 D is a standard Economy Class seat. Note that none of the seats on this plane recline. 18 E None No Power Seat 18 E is a standard Economy Class seat. Note that none of the seats on this plane recline. 18 F None No Power Seat 18 F is a standard Economy Class seat. Note that none of the seats on this plane recline. 19 A None No Power Seat 19 A is a standard Economy Class seat. Note that none of the seats on this plane recline. 19 B None No Power Seat 19 B is a standard Economy Class seat. Note that none of the seats on this plane recline. 19 C None No Power Seat 19 C is a standard Economy Class seat. Note that none of the seats on this plane recline. 19 D None No Power Seat 19 D is a standard Economy Class seat. Note that none of the seats on this plane recline. 19 E None No Power Seat 19 E is a standard Economy Class seat. Note that none of the seats on this plane recline. 19 F None No Power Seat 19 F is a standard Economy Class seat. Note that none of the seats on this plane recline. 2 A None No Power Seat 2 A is a standard Premium seat. Note that none of the seats on this plane recline. 2 B None No Power Seat 2 B is a standard Premium seat. Note that none of the seats on this plane recline. 2 C None No Power Seat 2 C is a standard Premium seat. Note that none of the seats on this plane recline. 2 D None No Power Seat 2 D is a Premium seat with extra legroom due to the position of the Bulkhead wall. The close proximity of the galley may be bothersome. The tray table is in the armrest, making the armrest immovable and slightly reducing seat width. There is no floor storage for this seat during take-off or landing. 2 E None No Power Seat 2 E is a Premium seat with extra legroom due to the position of the Bulkhead wall. The close proximity of the galley may be bothersome. The tray table is in the armrest, making the armrest immovable and slightly reducing seat width. There is no floor storage for this seat during take-off or landing. 2 F None No Power Seat 2 F is a Premium seat with extra legroom due to the position of the Bulkhead wall. The close proximity of the galley may be bothersome. The tray table is in the armrest, making the armrest immovable and slightly reducing seat width. There is no floor storage for this seat during take-off or landing. 20 A None No Power Seat 20 A is a standard Economy Class seat. Note that none of the seats on this plane recline. 20 B None No Power Seat 20 B is a standard Economy Class seat. Note that none of the seats on this plane recline. 20 C None No Power Seat 20 C is a standard Economy Class seat. Note that none of the seats on this plane recline. 20 D None No Power Seat 20 D is a standard Economy Class seat. Note that none of the seats on this plane recline. 20 E None No Power Seat 20 E is a standard Economy Class seat. Note that none of the seats on this plane recline. 20 F None No Power Seat 20 F is a standard Economy Class seat. Note that none of the seats on this plane recline. 21 A None No Power Seat 21 A is a standard Economy Class seat. Note that none of the seats on this plane recline. 21 B None No Power Seat 21 B is a standard Economy Class seat. Note that none of the seats on this plane recline. 21 C None No Power Seat 21 C is a standard Economy Class seat. Note that none of the seats on this plane recline. 21 D None No Power Seat 21 D is a standard Economy Class seat. Note that none of the seats on this plane recline. 21 E None No Power Seat 21 E is a standard Economy Class seat. Note that none of the seats on this plane recline. 21 F None No Power Seat 21 F is a standard Economy Class seat. Note that none of the seats on this plane recline. 22 A None No Power Seat 22 A is a standard Economy Class seat. Note that none of the seats on this plane recline. 22 B None No Power Seat 22 B is a standard Economy Class seat. Note that none of the seats on this plane recline. 22 C None No Power Seat 22 C is a standard Economy Class seat. Note that none of the seats on this plane recline. 22 D None No Power Seat 22 D is a standard Economy Class seat. Note that none of the seats on this plane recline. 22 E None No Power Seat 22 E is a standard Economy Class seat. Note that none of the seats on this plane recline. 22 F None No Power Seat 22 F is a standard Economy Class seat. Note that none of the seats on this plane recline. 23 A None No Power Seat 23 A is a standard Economy Class seat. Note that none of the seats on this plane recline. 23 B None No Power Seat 23 B is a standard Economy Class seat. Note that none of the seats on this plane recline. 23 C None No Power Seat 23 C is a standard Economy Class seat. Note that none of the seats on this plane recline. 23 D None No Power Seat 23 D is a standard Economy Class seat. Note that none of the seats on this plane recline. 23 E None No Power Seat 23 E is a standard Economy Class seat. Note that none of the seats on this plane recline. 23 F None No Power Seat 23 F is a standard Economy Class seat. Note that none of the seats on this plane recline. 24 A None No Power Seat 24 A is a standard Economy Class seat. Note that none of the seats on this plane recline. 24 B None No Power Seat 24 B is a standard Economy Class seat. Note that none of the seats on this plane recline. 24 C None No Power Seat 24 C is a standard Economy Class seat. Note that none of the seats on this plane recline. 24 D None No Power Seat 24 D is a standard Economy Class seat. Note that none of the seats on this plane recline. 24 E None No Power Seat 24 E is a standard Economy Class seat. Note that none of the seats on this plane recline. 24 F None No Power Seat 24 F is a standard Economy Class seat. Note that none of the seats on this plane recline. 25 A None No Power Seat 25 A is a standard Economy Class seat. Note that none of the seats on this plane recline. 25 B None No Power Seat 25 B is a standard Economy Class seat. Note that none of the seats on this plane recline. 25 C None No Power Seat 25 C is a standard Economy Class seat. Note that none of the seats on this plane recline. 25 D None No Power Seat 25 D is a standard Economy Class seat. Note that none of the seats on this plane recline. 25 E None No Power Seat 25 E is a standard Economy Class seat. Note that none of the seats on this plane recline. 25 F None No Power Seat 25 F is a standard Economy Class seat. Note that none of the seats on this plane recline. 26 A None No Power Seat 26 A is a standard Economy Class seat. Note that none of the seats on this plane recline. 26 B None No Power Seat 26 B is a standard Economy Class seat. Note that none of the seats on this plane recline. 26 C None No Power Seat 26 C is a standard Economy Class seat. Note that none of the seats on this plane recline. 26 D None No Power Seat 26 D is a standard Economy Class seat. Note that none of the seats on this plane recline. 26 E None No Power Seat 26 E is a standard Economy Class seat. Note that none of the seats on this plane recline. 26 F None No Power Seat 26 F is a standard Economy Class seat. Note that none of the seats on this plane recline. 27 A None No Power Seat 27 A is a standard Economy Class seat. Note that none of the seats on this plane recline. 27 B None No Power Seat 27 B is a standard Economy Class seat. Note that none of the seats on this plane recline. 27 C None No Power Seat 27 C is a standard Economy Class seat. Note that none of the seats on this plane recline. 27 D None No Power Seat 27 D is a standard Economy Class seat. Note that none of the seats on this plane recline. 27 E None No Power Seat 27 E is a standard Economy Class seat. Note that none of the seats on this plane recline. 27 F None No Power Seat 27 F is a standard Economy Class seat. Note that none of the seats on this plane recline. 28 A None No Power Seat 28 A is a standard Economy Class seat. Note that none of the seats on this plane recline. 28 B None No Power Seat 28 B is a standard Economy Class seat. Note that none of the seats on this plane recline. 28 C None No Power Seat 28 C is a standard Economy Class seat. Note that none of the seats on this plane recline. 28 D None No Power Seat 28 D is a standard Economy Class seat. Note that none of the seats on this plane recline. 28 E None No Power Seat 28 E is a standard Economy Class seat. Note that none of the seats on this plane recline. 28 F None No Power Seat 28 F is a standard Economy Class seat. Note that none of the seats on this plane recline. 29 A None No Power Seat 29 A is a standard Economy Class seat. Note that none of the seats on this plane recline. 29 B None No Power Seat 29 B is a standard Economy Class seat. Note that none of the seats on this plane recline. 29 C None No Power Seat 29 C is a standard Economy Class seat. Note that none of the seats on this plane recline. 29 D None No Power Seat 29 D is a standard Economy Class seat. Note that none of the seats on this plane recline. 29 E None No Power Seat 29 E is a standard Economy Class seat. Note that none of the seats on this plane recline. 29 F None No Power Seat 29 F is a standard Economy Class seat. Note that none of the seats on this plane recline. 3 A None No Power Seat 3 A is a standard Premium seat. Note that none of the seats on this plane recline. 3 B None No Power Seat 3 B is a standard Premium seat. Note that none of the seats on this plane recline. 3 C None No Power Seat 3 C is a standard Premium seat. Note that none of the seats on this plane recline. 3 D None No Power Seat 3 D is a standard Premium seat. Note that none of the seats on this plane recline. 3 E None No Power Seat 3 E is a standard Premium seat. Note that none of the seats on this plane recline. 3 F None No Power Seat 3 F is a standard Premium seat. Note that none of the seats on this plane recline. 30 A None No Power Seat 30 A is a standard Economy Class seat. Note that none of the seats on this plane recline. 30 B None No Power Seat 30 B is a standard Economy Class seat. Note that none of the seats on this plane recline. 30 C None No Power Seat 30 C is a standard Economy Class seat. Note that none of the seats on this plane recline. 30 D None No Power Seat 30 D is a standard Economy Class seat. Note that none of the seats on this plane recline. 30 E None No Power Seat 30 E is a standard Economy Class seat. Note that none of the seats on this plane recline. 30 F None No Power Seat 30 F is a standard Economy Class seat. Note that none of the seats on this plane recline. 31 A None No Power Seat 31 A is a standard Economy Class seat. Note that none of the seats on this plane recline. 31 B None No Power Seat 31 B is a standard Economy Class seat. Note that none of the seats on this plane recline. 31 C None No Power Seat 31 C is a standard Economy Class seat. Note that none of the seats on this plane recline. 31 D None No Power Seat 31 D is a standard Economy Class seat. Note that none of the seats on this plane recline. 31 E None No Power Seat 31 E is a standard Economy Class seat. Note that none of the seats on this plane recline. 31 F None No Power Seat 31 F is a standard Economy Class seat. Note that none of the seats on this plane recline. 32 A None No Power Seat 32 A is a standard Premium seat. Note that none of the seats on this plane recline. 32 B None No Power Seat 32 B is a standard Premium seat. Note that none of the seats on this plane recline. 32 C None No Power Seat 32 C is a standard Premium seat. Note that none of the seats on this plane recline. 32 D None No Power Seat 32 D is a standard Premium seat. Note that none of the seats on this plane recline. 32 E None No Power Seat 32 E is a standard Premium seat. Note that none of the seats on this plane recline. 32 F None No Power Seat 32 F is a standard Premium seat. Note that none of the seats on this plane recline. 33 A None No Power Seat 33 A is a Premium seat in the last row of the plane whose close proximity to the lavatories and galley may be bothersome. There is no overhead bin storage for this row as it is usually used for crew and safety equipment. 33 B None No Power Seat 33 B is a Premium seat in the last row of the plane whose close proximity to the lavatories and galley may be bothersome. There is no overhead bin storage for this row as it is usually used for crew and safety equipment. 33 C None No Power Seat 33 C is a Premium seat in the last row of the plane whose close proximity to the lavatories and galley may be bothersome. There is no overhead bin storage for this row as it is usually used for crew and safety equipment. 33 D None No Power Seat 33 D is a Premium seat in the last row of the plane whose close proximity to the lavatories and galley may be bothersome. There is no overhead bin storage for this row as it is usually used for crew and safety equipment. 33 E None No Power Seat 33 E is a Premium seat in the last row of the plane whose close proximity to the lavatories and galley may be bothersome. There is no overhead bin storage for this row as it is usually used for crew and safety equipment. 33 F None No Power Seat 33 F is a Premium seat in the last row of the plane whose close proximity to the lavatories and galley may be bothersome. There is no overhead bin storage for this row as it is usually used for crew and safety equipment. 4 A None No Power Seat 4 A is a standard Premium seat. Note that none of the seats on this plane recline. 4 B None No Power Seat 4 B is a standard Premium seat. Note that none of the seats on this plane recline. 4 C None No Power Seat 4 C is a standard Premium seat. Note that none of the seats on this plane recline. 4 D None No Power Seat 4 D is a standard Premium seat. Note that none of the seats on this plane recline. 4 E None No Power Seat 4 E is a standard Premium seat. Note that none of the seats on this plane recline. 4 F None No Power Seat 4 F is a standard Premium seat. Note that none of the seats on this plane recline. 5 A None No Power Seat 5 A is a standard Premium seat. Note that none of the seats on this plane recline. 5 B None No Power Seat 5 B is a standard Premium seat. Note that none of the seats on this plane recline. 5 C None No Power Seat 5 C is a standard Premium seat. Note that none of the seats on this plane recline. 5 D None No Power Seat 5 D is a standard Premium seat. Note that none of the seats on this plane recline. 5 E None No Power Seat 5 E is a standard Premium seat. Note that none of the seats on this plane recline. 5 F None No Power Seat 5 F is a standard Premium seat. Note that none of the seats on this plane recline. 6 A None No Power Seat 6 A is a standard Economy Class seat. Note that none of the seats on this plane recline. 6 B None No Power Seat 6 B is a standard Economy Class seat. Note that none of the seats on this plane recline. 6 C None No Power Seat 6 C is a standard Economy Class seat. Note that none of the seats on this plane recline. 6 D None No Power Seat 6 D is a standard Economy Class seat. Note that none of the seats on this plane recline. 6 E None No Power Seat 6 E is a standard Economy Class seat. Note that none of the seats on this plane recline. 6 F None No Power Seat 6 F is a standard Economy Class seat. Note that none of the seats on this plane recline. 7 A None No Power Seat 7 A is a standard Economy Class seat. Note that none of the seats on this plane recline. 7 B None No Power Seat 7 B is a standard Economy Class seat. Note that none of the seats on this plane recline. 7 C None No Power Seat 7 C is a standard Economy Class seat. Note that none of the seats on this plane recline. 7 D None No Power Seat 7 D is a standard Economy Class seat. Note that none of the seats on this plane recline. 7 E None No Power Seat 7 E is a standard Economy Class seat. Note that none of the seats on this plane recline. 7 F None No Power Seat 7 F is a standard Economy Class seat. Note that none of the seats on this plane recline. 8 A None No Power Seat 8 A is a standard Economy Class seat. Note that none of the seats on this plane recline. 8 B None No Power Seat 8 B is a standard Economy Class seat. Note that none of the seats on this plane recline. 8 C None No Power Seat 8 C is a standard Economy Class seat. Note that none of the seats on this plane recline. 8 D None No Power Seat 8 D is a standard Economy Class seat. Note that none of the seats on this plane recline. 8 E None No Power Seat 8 E is a standard Economy Class seat. Note that none of the seats on this plane recline. 8 F None No Power Seat 8 F is a standard Economy Class seat. Note that none of the seats on this plane recline. 9 A None No Power Seat 9 A is a standard Economy Class seat. Note that none of the seats on this plane recline. 9 B None No Power Seat 9 B is a standard Economy Class seat. Note that none of the seats on this plane recline. 9 C None No Power Seat 9 C is a standard Economy Class seat. Note that none of the seats on this plane recline. 9 D None No Power Seat 9 D is a standard Economy Class seat. Note that none of the seats on this plane recline. 9 E None No Power Seat 9 E is a standard Economy Class seat. Note that none of the seats on this plane recline. 9 F None No Power Seat 9 F is a standard Economy Class seat. Note that none of the seats on this plane recline. All drinks, including soft drinks, are available for purchase on-board. On select flights, food items are also available for purchase. Click here for more information. This Boeing 737-800 has 189 seats in a two class configuration. None of the seats on this aircraft recline. Ryanair now offers Premium seats in rows 1-5, 16, 17, 32, and 33. Which gives travelers priority boarding, extra legroom and faster disembarking for a fee of €17/£15. Standard seats in rows 6-15 and 18-31- travelers can preselect any seat in these rows for a fee of €5/£5. 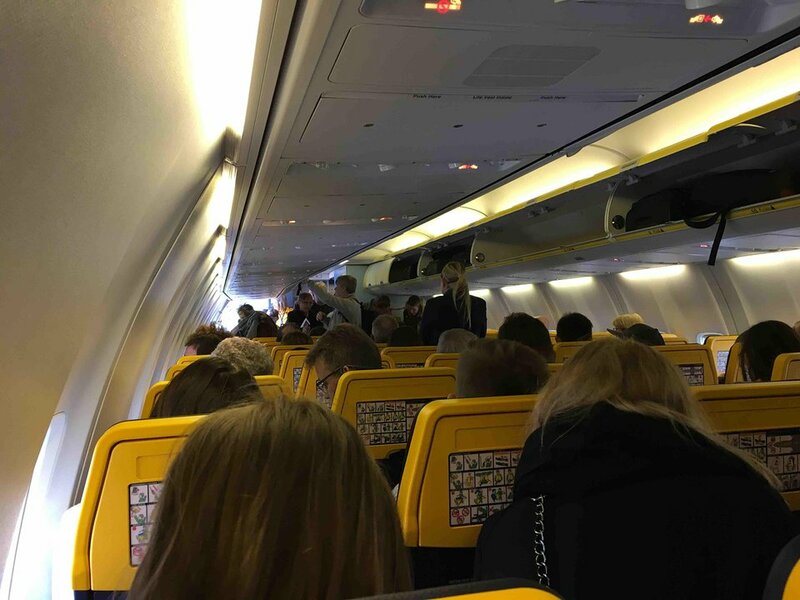 Priority Boarding can be added as well for an extra €2/£2. Can't recommend this seat. Although legroom was great, people were bumping into me all the time - it seems that this seat is simply in the way for everyone entering the plane or going to the restroom. The middle seat 1B is much better and even the window seat 1A is more comfortable, yet the door protrudes a bit into the cabin in front of that seat. This is a emergency exit window seat. 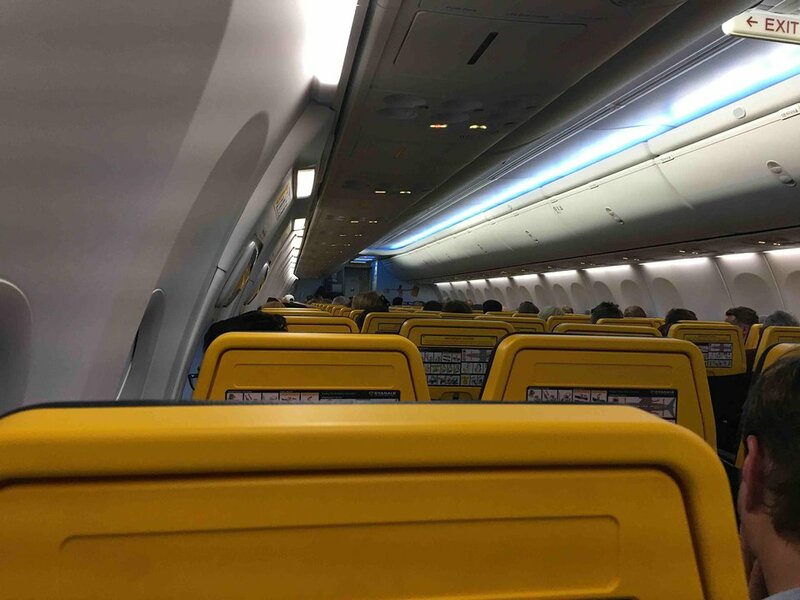 On Ryanair the seat has no armrest and tilts towards the window. It is very uncomfortable. The other seats in the emergency exit section are much more comfortable and have good legroom. (New Sky Interior) Excellent window position. Good legroom, although door protrudes slightly, but flight crew are not directly opposite. Poor storage pouch on left. Poor tray table - droops to left because no support. Bad ventilation. (Pre-Sky Interior) Excellent legroom with door only protruding slightly, and flight crew not directly opposite. Excellent window. Excellent storage pouch on left. Good ventilation. Slightly cold feet due to proximity of door. Bad tray table - droops to left because no support on that side. There are cylinders in the luggage rack reserved for the 14 row. The room for legs at this row is absolutely horrible (I'm "only" 1m85 tall! ), much less than at 11A than I got for my return flight (FR200). I cannot explain such differences for seats in the same category. Do you? No direct window (even if watching to the window slightly behind is still possible), but room for leg is much better than at the 32B that I got for my other flight (FR201). 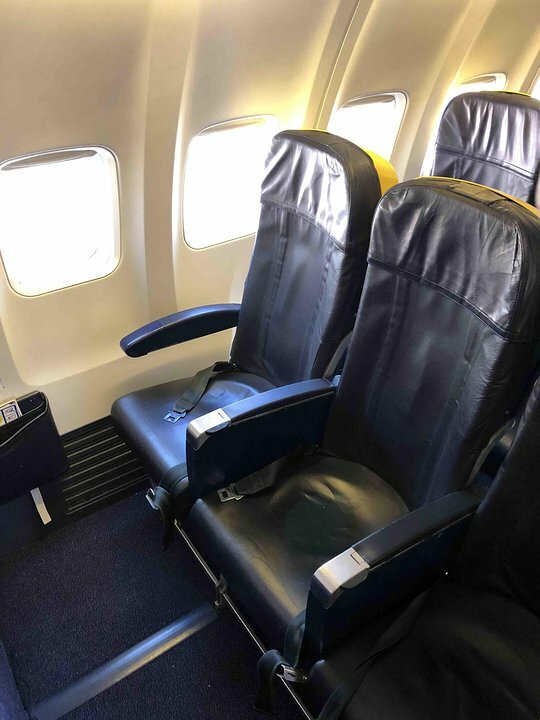 I can confirm, that while it doesn't actually say so anywhere on Ryanair's website or in official communication, legroom is actually better on some of the "premium" seats, at least on row 4. I am fairly tall, and a bit bulky (you might say), and I could easily sit in 4E with the table tray down and still have some space between myself and the tray. When I flew home a few days later, I was in row 32, and that was much more cramped. OK seat, as for someone who's height is 168cm, enough leg room, but the armrest in the Sky Interior design are so short, that they do not function as ARMrests at all, and the window is aligned in a way, that you cannot confortably lay down to the right. The seat was comfortable for the price. Quite short legroom and overpriced meals but totally worth it for the price. One big plus about this seat- you get to exit the plane first, becasue they use both doors. The whole plane doesn't recline, so that's not an issue any more, and the toilets didn't bother me one bit. No smell, hardly any noise, especially on such a short flight from Tel Aviv to Paphos. On short-haul flights, the last row (at least the aisle seats, C & D), should be marked green in my opinion. Flew Tel Aviv to Paphos and back a week later. Seats do not recline. Leg room doesn't really exist. I'm 187cm tall (6'2) and my knees didn't just touch the seat in front of me, they were pressed against it. Luckily, these flights are only 50 minutes each way, and I had a little girl next to me on the flight out, and an empty middle seat on the way back, so managed it. The FA were courteous, polite, nice and professional. The flights were fairly good too. Bottom line- you get what you pay for, and I was pleased. Will not fly with Ryanair on a longer flight because that will be a nightmare. Short-haul- perfect. long-haul- fly someone else. Flew BUD-CIA and PRG-MAD with Ryanair. Yes you get what you pay for, but both flights I've taken with Ryanair have been just fine! 30 inch pitch is no different than many domestic airlines in the US. As a 6'2" guy I could barely last 2 hours on this STN-GDN flight. Not the most comfortable seats out there, especially for you bottom. But I guess you get what you pay for. Tickets were cheap and the whole experience as expected. As a 6'2" guy I could barely last 2 hours on this GDN-STN flight. Not the most comfortable seats out there, especially for you bottom. But I guess you get what you pay for. Tickets were cheap and the whole experience as expected. The most horrible seat i've ever seen. The 1h 45m flights Naples-Kracov v.v. were a nightmare. I'll avoid to fly again with this airline if I've anoter choice. Horrible experience from LPA-PIK. Do not be fooled by the "premium" seat; basically it means that you board quicker but it certainly doesnt mean that you leave quicker when everyone behind starts trying to leave the plane and blocking you in while you try to get your bag from the overhead locker, its chaotic. Seat uncomfortable, I'm 6ft 1" and struggled to get comfortable for the entire 4.5hr flight. Yes you get what you pay for with Ryanair but jeez, if I can avoid flying with them in future then I will. The last row seats are the best, because there is nobody seating behind you and you feel as you have a bit more privacy. The seat 02F is the best because of the window, the legroom and its the only seat with that kind wrack for putting books, phones....well, the seat 1A also has it but I dont like the first row becouse is very near to the air attendants seats, the door, the gally...this seat is the best. Yesterady I have flown EI-FTH: wonderful plane, very comfortable in row 21! Frond row is the best because your foot space is great! BUT! The seats are very norrow because the table is inside the armchair so the space of the seat is smaller.one more problem is that the seat is next to the aircraft door so its a little bit cold for the feet.next time i will choose first row again but seats D,E,F!! Ryanair Premium seats do NOT have more legspace, except those in the first rows and emergency exit rows. Premium seats come with priority embarking and debarking. You get off the plane faster. Good seat, plenty of room. Knees a couple of inches from the row ahead (unlike row 15). No issues with 22C. Seat 15C has very little legroom, even by Ryanair standards, indeed, looking at other reviews it seems to be an entire row where a couple of inches were sacrificed. I was beside two quite petite Asian women and their knees were touching the back of the seats ahead. Very unpleasant. Row 33 on Ryanair's 737s has much more leg room than otyer seats. Also very comfortable so I don't understand why you call it a bad seat. 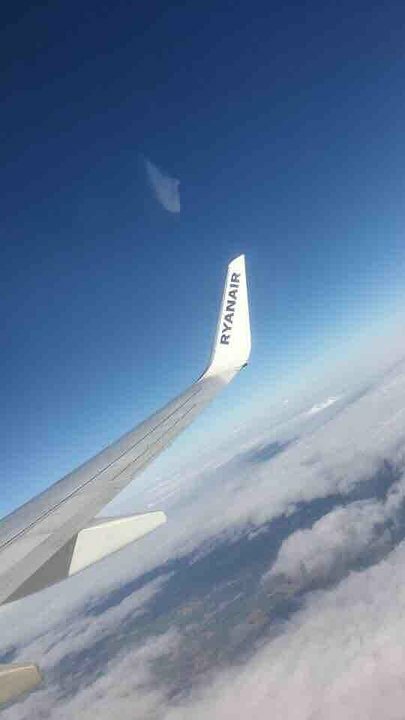 First time I fly with Ryanair, and i liked it, quick smooth no problems. The flight was completely full, I was asked to leave my suitcase for check in. Easy take off and landing. As with all aisle seats on this aircraft I had retricted foot space under seat in front because of seat support. This make is very difficult when you have to put your had bag and your feet under the seat. My companion sat in b and defnately had more foot space. It also appeared that the aisle seats are slightly narrower than other seats. Thanks to your Seat Plan and two comments on Trip Advisor I was able to change my seat for a window Seat. There is nothing on Ryanair to indicate there is no window for seat 11a when booking!! Even the Ryanair Chat line host did not know that until I quoted your seat plan!!!!! As a fairly large and tallish (186cm) guy I found this seat pretty nice. Passengers in 2E and 2F could get past without me having to stand up and the major benefit of the isle seat over the other two is you get to be the fourth person off the plane. However it is the tightest seat I have been in on a plane but acceptable for an hour or two and was worth it for the leg space. As with all Ryan air seats the padding is thin and after 90mins was becoming uncomfortable. The only thing that I really disliked is that half of the people boarding the plane hit me with their bags on the way past. As a fairly large and tallish (186cm) guy I found this seat pretty nice. Passengers in 2E and 2F could get past without me having to stand up and the only benefit of the isle seat over the other tow is you get to be the fourth person off the plane. It is tight and you need to be aware of what is in your pockets but acceptable for an hour or two. Only real downside is half of the people boarding the plane hit me with their bags. The extra seat cost was worth it in my opinion. PERFECT!!! I love this seat. Ryanair FR5892 - Krakow-Eindhoven aircraft. Not enough leg space for tall persons. I'm 165 and I was fine but my neighbor was way taller and looked quite uncomfortable. I seat on 6A seat with window. This seat is good for me. Not the best airline ive flown with but its cheap and does the trick, was fine for a flight from manchester to majorca and would use them again. The new seats of RYANAIR are a BIG improvement in terms of available space. I am 6' 2'' (191cm) and I have long legs. There was a decent amount of space between my knees and the front seat. I am NOT a ryanair employee. Totally disappointed with this seat as it has no window. We booked our seats in advance and on the way back from Faro last night discovered I had drawn the short straw. I enjoy flying but this seat ruined the whole experience for me. Don't be misguided when it says that the first few rows are Premium seats. They have the exact same legroom and recline and the other difference is that they are closer to the front of the plane. The only seats with extra legroom are the Exit Row Seats and Row 1. Legroom is of course cramped and its uncomfortable during a long flight, but does the job for an hour or so. I found the width of normal seats to be OK (15F, 18F) - there is a small armrest which can be lifted up if you/your partner need more room. Leg room on normal seats however is very cramped - I am 5 ft 8 and my knees touched the seat in front (15F). My partner is 6ft 4 and he had to encroach on the aisle! However I did find legroom to be slightly better in row 18 - this is just behind the exit rows and for some reason seemed to have an extra couple of inches room. The exit row seats have fixed arms and are exceedingly narrow - be warned that if you are anything more than 'slim' then these seats will be uncomfortable despite the generous leg room!!! Constant sharp noise from toilet flush, also seats lack space at the back as very tight. I personally, do not regard this as a 'bad' seat. If the front seats are not available, I book the back row so I am nearer to the galley and therefore, the refreshments. In other words, you get served first. Many of those comments sound like they were written by Ryanair employees..tight seats to begin with, when we finally got them. Anyway, their online computers were down for over a week so we couldn't print boarding passes on six different phones and one computer..ka-ching $20 more per person. Then they gave us paper tickets with seats that someone else was already sitting in (ticketing computers down)! !..it's a sleazy operation, no wonder the owner is a billionaire. Window seats in Ryanair Emergency Exit rows do not have a stub to hold the folding tray table (due to the missing armrest, as already indicated). Due to this the tray table is very unstable and (depending on the condition of the mechanism) often slanted and unsuitable to hold a laptop or tablet. Comfortable and more than enough leg room for me, though I am only 5'7". A good position behind the wing. Priority boarding for a seat towards the back of the aircraft is ideal. Almost all priority boarders book seats at the front and queue at the front steps. There were three of us heading to the rear steps! I just traveled on seat 33A. Avoid it. There's nothing premium about the last row, and the proximity to the rear door of the aircraft can actually turn into a major drawback. 33A offers less overall room due to the shape of the fuselage. I felt cramped and had to turn to my side to fit, while on the return flight I was in 20F and it was a lot more comfortable. Seats in the last row can't recline (but I never do) and don't have overhead lockers, so you'll have to use the space allotted to other seats. This means that unless the flight is empty (and it is hard to imagine it will ever be), the proximity to the rear door can backfire if you're not among the first passengers to board the plane from the rear. In fact, overhead lockers fills up quickly, so you may have to find a place for your trolley farther inside the plane, which means you might have to disembark using the front door coming from the very end of the tail section (read: as the very last passenger). Depending on your destination, seat 33A is pretty much okay. As long as there is no boarding/deboarding through the finger (like it happens in BRU for Non-Schengen flights), you are next to the rear exit and can board and leave the plane pretty quick. Good leg room in bulkhead seats 2D and 2E but the cost of checked baggage takes away all the savings for the flight itself. Due to the baggage handlers strike in Madrid passengers on this flight were allowed a little leeway to take two carry on bags aboard. This made loading very slow due to the amount of luggage carried in the plane. 2D and 2E are bulkhead seats and do have extra leg room. There's nothing else positive about this cheap way of getting from a to b. Was flying on a 2,5 hr flight and could not complain about legroom (I'm 6"2) or boarding times. No Overhead luggage and the proximity to the lavatory was bothersome a bit but overall a nice and comfortable flight for the price! We were allocated 33A and 33B during on-line check-in for no additional fee. No nuisance from lavatories or galley, plenty of overhead locker space just 1 row forward. Easy access from rear doors. Don't be put-off by negative comments! IA has lots of leg room but as others have said the seat is very narrow. Its comfortable for a couple of hours but I wouldnt like it for much longer as the seat is pretty firm. Im over 6' tall and had no problem with the door protruding into the seat space. Priority boarding is good too and esential. 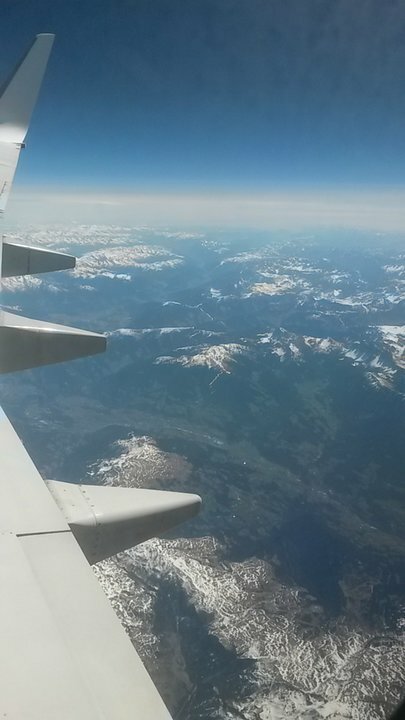 Seat was comfortable enough for a flight from stansted to pisa. Enough legroom to strech your legs as this is a premium seat and you are one of the first to board and get off. Great, unlimited legroom, first to board and deplane. The seat is unfortunately very narrow, due to tray table in the armrest. Overall I was happy I paid additional 10 euro for this seat. Would do it again. Excellent leg room, remarkable for economy, best I've ever experienced. Very comfortable with tremendous views of the wing and beyond. Superb value for money, tons of legroom, I'm six foot, moaners will always be there. i use Ryanair all the time and find their service superb. Flights are short and seats have plenty room. All i can say is ryanair has33 rows and norwegian has exactly the same aircraft with31 rows. There is no leg room on ryanair and if a 6 foot tall man says he had lots of room I am afraid he is an unusual person for his size. I am also 6 foot. I fly in excess of 100 times a year, mainly with BA, and ryanair are by far the worst airline in Europe. Comments do not indicate how much extra leg room there is for the extra money. However, getting on and off faster is worth something by itself. Considering what BA charges in economy class for flights from Heathrow to Budapest, this was good value for the money. The overall experience is not much worse than BA. I flew STD to Gdansk. It was a choice between Ryanair and Wizz. Paid additional £10 for "premium" seat. Seat was ok, plenty of leg room. Follow the rules that Ryanair set ( check in online, travel light ect ). Perfect, plenty of legroom (nothing like people say about Ryanair) and it was a comfortable flight. The gangway is very tight and people queuing up for the toilets bang your seat and knock things over your lap tray - will not be booking this seat again. Fellow passengers in 1a and 1b were very happy. Plenty of extra legroom due to it being an emergency exit row. Only drawback is that there is not an armrest on the window side of the seat. I travel with Ryanair to Fuerteventura 6 times a year and at 6'2" never had any problem with leg room. The fact the seats don't recline is a bonus as the person in front can't reduce your space. I take a inflatable pillow for the small of my back which works well. In flight, I have a Boots "meal deal" and watch films on my tablet with noise cancelling headphones. 4 hours literally fly by. Ryanair state clearly what they offer and what you get. They are by far the best cheapest airline on the market. Ryanair offer much better leg room than most charter airlines, the price is fair and the service is usually good. I remember being crammed into a Thomson 737 like sardines a few years ago, not able to move at all because the seat in front of me was so close. Crammed in like a fool to save a few quid. Seat uncomfortable, little leg room, no recline, no rear seat pocket, horrible. Paid the extra £10 for an exit seat which included priority boarding. I boarded the plane first and got settled. The seat was just as good as any other low-cost or holiday airline. The overhead lockers filled up fast and people were struggling to find places to put their cases so I was pleased to be on board early on. Overall, worth the money. The emergency exit window seats, 17A, 18A, 17F and 18F do not have an armrest both sides. They do not have an armrest on the side by the exit. If you find the normal seats really narrow, these are great seats to choose as you have several more inches of space! Now you can book seating at Ryanair, I booked first row at extra charge. Good legspace but the most narrow seat I have ever seen! Not 17 but 16 inches, so normal people have no room, terrible. Flew back with Norwegian, really good and almost same price. Ryanair flies 1 versions of Boeing 737-800.